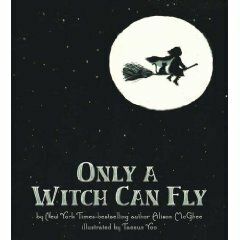 Only a Witch Can Fly by Alison McGhee, illustrated by Taeeun Yoo. Feiwel & Friends, 2009. Review copy supplied by publisher. Picture book. The Plot: A young witch desperately wants to fly. The Good: This story of learning to fly is written as a sestina. The repartition both lulls the reader and reassures the reader, while cheering on the young witch in her goal: flight. This also makes it a great read aloud; there is something about poetry that just works better when read. On the surface, this is a story of try, try again, similar to stories of learning how to ride a bike or swim. But, this is flight. Something so much more than just riding or swimming; flying is about growing up and leaving childhood behind, it's about not accepting limitations, and it's about freedom. Only a witch can fly." And I read those final words and thought, "and we are all witches." Let me tell you, that photo of the cover doesn't give the actual cover justice. The moon is a soft, light butter yellow that matches the font of the title and it just makes you go "oooohhhh... I must pick this up. I must touch this cover." The colors throughout the book are warm: black, brown, orange, green. Yoo shares details about her art at an interview with Seven Impossible Things Before Breakfast. And the young witch has striped stockings. I so, so want those types of stockings but alas, at my age cannot carry off that look. The Poetry Friday round-up is at Becky's Book Reviews. I love the idea that we are all witches! ha! I must look for this one, particularly if it's a sestina that made a picture book - I'd love to see how she did it! I was just working on fantasy-themed sestinas with a group of teens. I'll have to take a look at this book!